Gresham SportsCare was founded in 1982 by Clem Eischen when he expanded deeper into East Multnomah County. 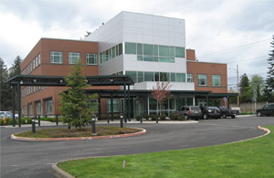 The first SportsCare clinic was located at 122nd and NE Glisan Street. Although the area has gone through quite a few changes, the directors of Gresham, NE Portland, Clackamas and Beaverton SportsCare clinics continue to congregate in the original area bi-monthly for breakfast meetings at Pig-n-Pancake! Gresham SportsCare’s treatment philosophy has not changed over the years. We continue to emphasize cutting edge technology and an upbeat-friendly atmosphere to help injured athletes, workers or every day individuals recover from injury. An example of our technologically advanced treatment options is our AlterG Anti-Gravity Treadmill. This is the same treadmill that athletes such a Kobe Bryant have used to recover quickly after injury and surgery. In a nutshell, when in the Alter-G treadmill, a person can walk or run at 30%, 50% or 80% (or any increment between 20-100%) of body weight. This allows people to begin EARLY weight bearing after ankle, knee or hip injury or surgery, often cutting the rehabilitation time in half! Examples of other types of injuries and conditions that we commonly treat include: Neck and back injuries, rehab after Cervical & Lumbar surgery, Rotator Cuff and Labrum repairs, Shoulder impingement syndrome, ACL Reconstruction, PCL reconstruction, Total knee, hip, ankle and shoulder replacement, all joint Sprain and Strains and Plantar fasciitis. Even though Physical therapy can be hard work and not always the most fun, your experience at Gresham SportsCare should be enjoyable. We try to make everyone feel welcome and we love getting to know each and every patient individually. Work hard, have fun and play hard! Tell a joke or two and smile while doing your exercise! That is the best way to make a full recovery! Gresham SportsCare is proud to be a long-standing member of the Gresham and East County area and we look forward to continuing our close working relationship with the High Schools, physicians and community at large. If you want to schedule at appointment at Gresham SportsCare, give our clinic a call at 503-491-1666 or click here to request an appointment online.